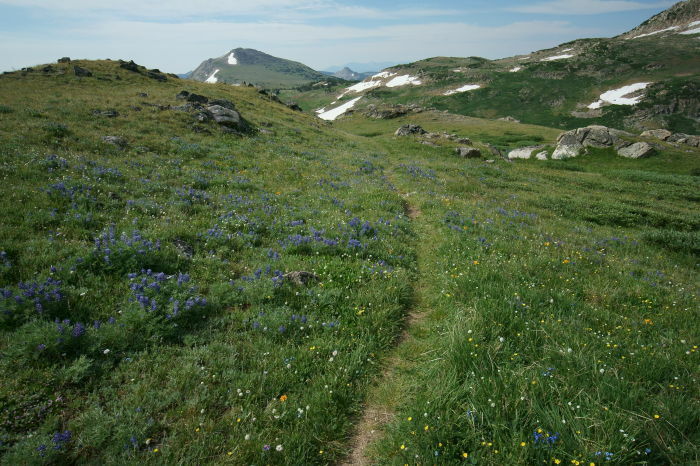 You’ll find one of the Beartooth Highway’s most obvious and easily accessible hiking trails near Beartooth Pass. 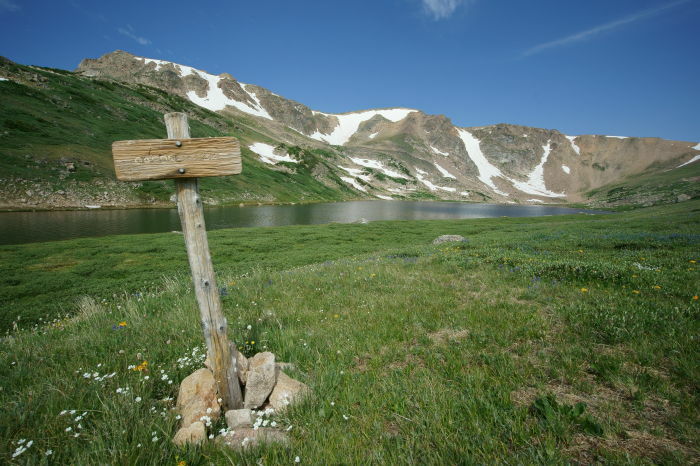 The Gardner Lake Hiking Trail is only about 3/4 of a mile long (one way), and while it does require an elevation loss (and gain on the return) of about 600 feet, it’s still a decent option for a beautifully scenic hike without a huge time commitment. And in this location, stopping to enjoy the scenery just gives you an excuse to catch your breath. 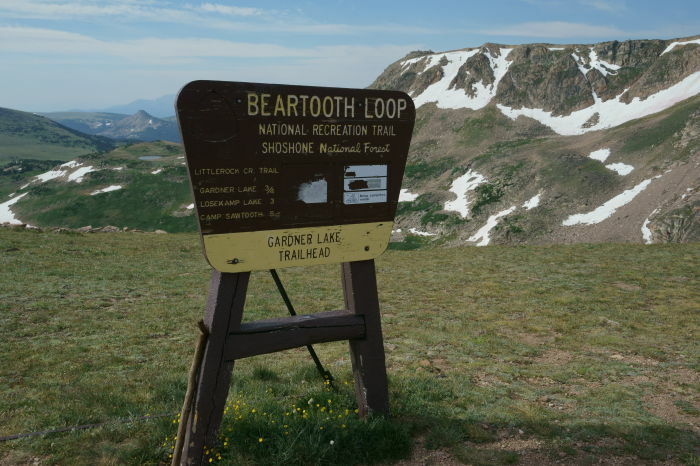 The Gardner Lake Hiking Trail is located along US 212, the Beartooth Highway. 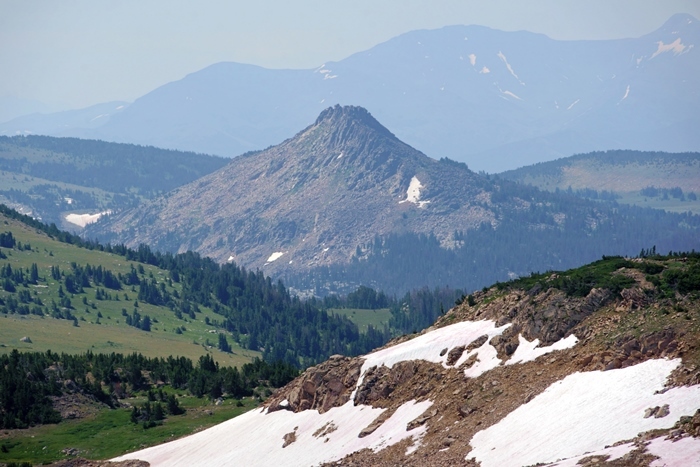 From Beartooth Pass, head east, down the switchbacks, and look for the large parking area on the south side of the road. The trail begins there. My day started at the Top of the World Motel, so I didn’t have to travel far to get started on this hike. Gardner Lake can be seen from the parking area, just off the Beartooth Highway, and I had decided the previous day that this would be my first hike of the day. There’s Gardner Lake, straight down a steep slope. 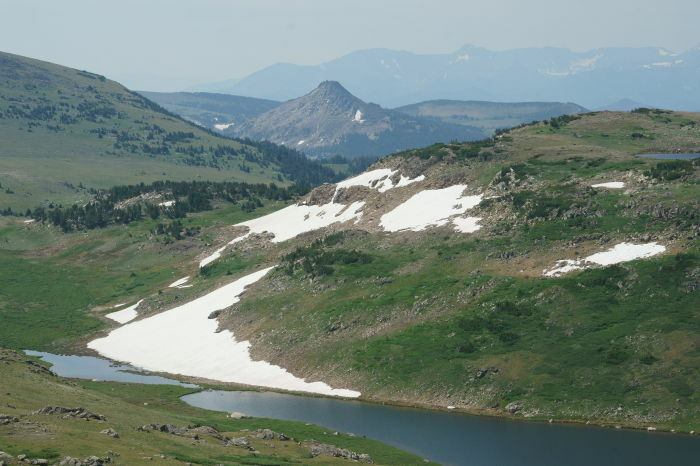 Beartooth Pass is just up that hill on the right. On the left, the slope is less steep, and this is where the trail is located. The trip down isn’t very difficult, but of course, I spent the entire time dreading the climb back up. A 600-foot elevation gain on the return trip, over 3/4 of a mile, works out to about a 15% grade. You might find some loose rock on the trail, but otherwise, it’s easy to hike, and I saw some families with children tackling it (although the kids weren’t very happy on the way back up). …but there is a spot where you can hike down to a giant boulder at the water’s edge. I climbed up on the boulder and relaxed for a while, until some other hikers came down the trail. Then, I let them have a seat on the boulder, and I hiked a bit further. Once the snow melts, wildflowers emerge. You’ll find plenty of them along this trail! The path continues on for several more miles. 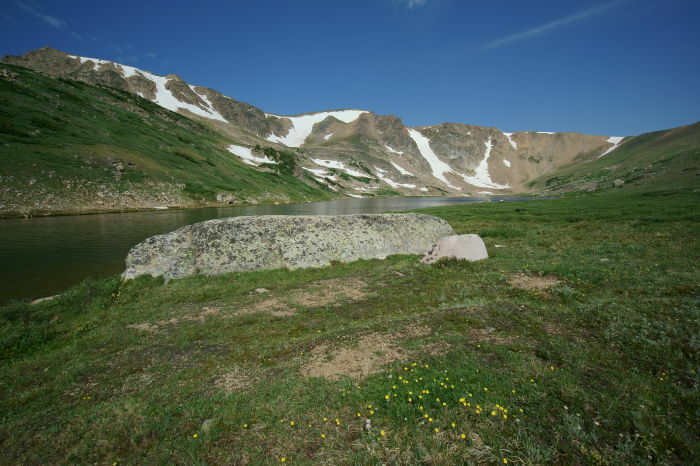 The next destination is Losekamp Lake, which is about 3 miles from the trailhead, or a little more than 2 miles from this point. It’s probably a very beautiful hike, but there’s just one problem. 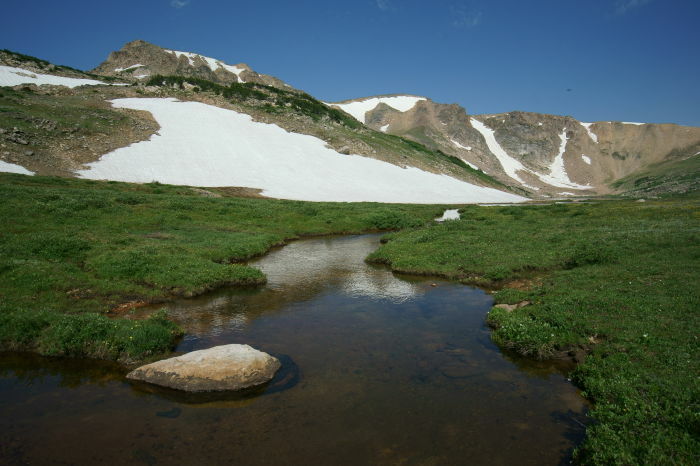 In order to keep hiking, you’ll have to splash through this water. This creek is the outlet of Gardner Lake. The trail simply stops at the water and resumes on the other side. I didn’t see any place to cross where I could keep my feet dry, so I decided not to go any further. Still, it’s worth it to hike all the way out to this point, just to enjoy the view looking back towards the highway. And yes, that’s a whole lot of unmelted snow over there, in July. … and Sawtooth Mountain in the middle. But, I could be wrong. Drop a comment below if you know the correct names. The only downside to the hike to Gardner Lake is the tough climb back up the hill. If you’re prepared for that slog, go ahead and make the trek down to the lake, and enjoy the views along the way. 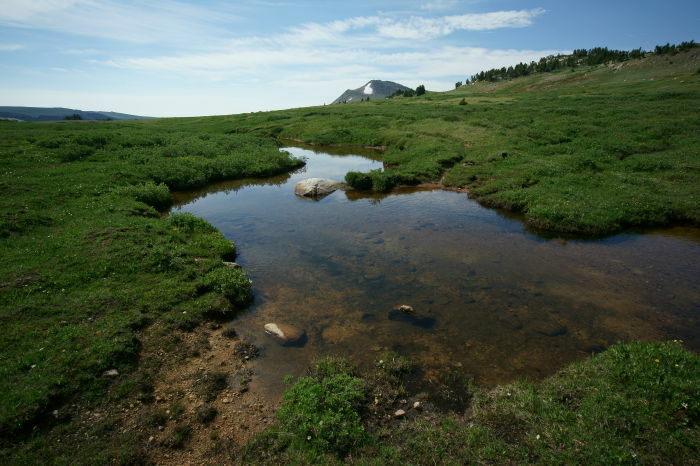 If you have the time, and you don’t mind the water crossing, make a day of it, and keep hiking on to Losekamp Lake or beyond.